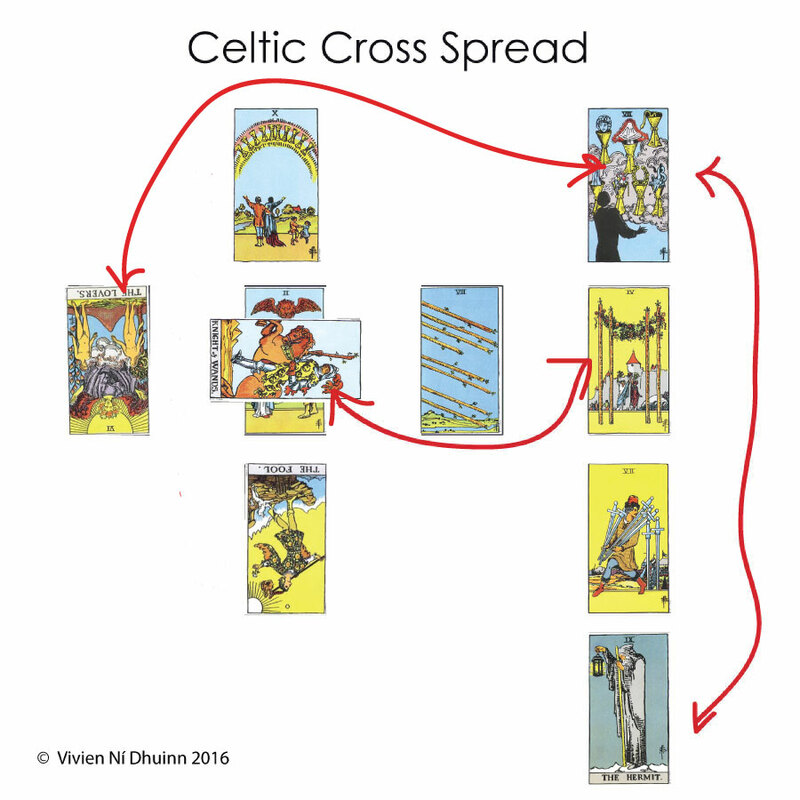 Now that we have learned about the Origins and Layout of The Celtic Cross Spread, the next step in Mastering it is to learn how to actually read it. 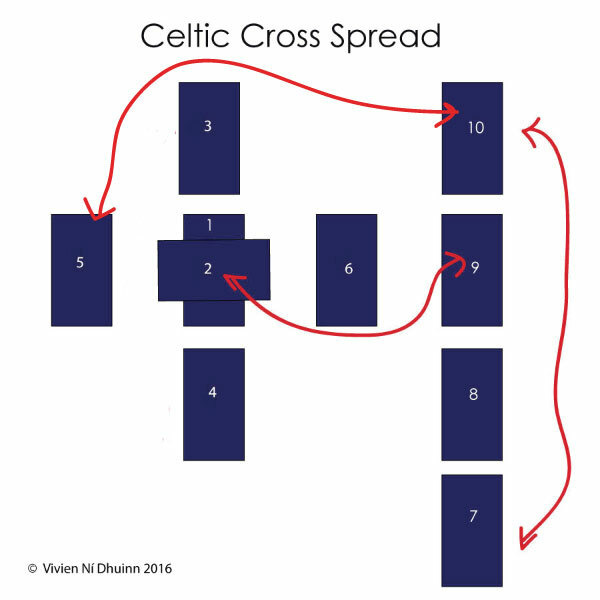 Below I have created a collection of 8 Diagrams to demonstrate the many ways in which the Cards in the Celtic Cross Spread can be linked, compared, cross-referenced and connected during interpretation, so that the overall story can be extracted and gathered, rather than attempting Card-by-Card analysis. I have not placed the Diagrams in any particular order, but needless to say there are certain ones you should address from the outset. the central ones, Card 1 and 2. Cleanse and Protect, your Space, your Energy-Field and Cards. 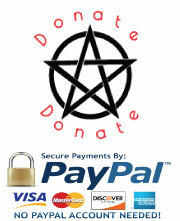 For further information on Psychic Protection Click Here and Here for the different methods. Agree on your Question or Intention for The Spread. Decide which version of The Celtic Cross Spread you wish to work with. Decide if you wish to use a Significator or not. Significators are not compulsory. Significators are usually drawn before Shuffling commences. 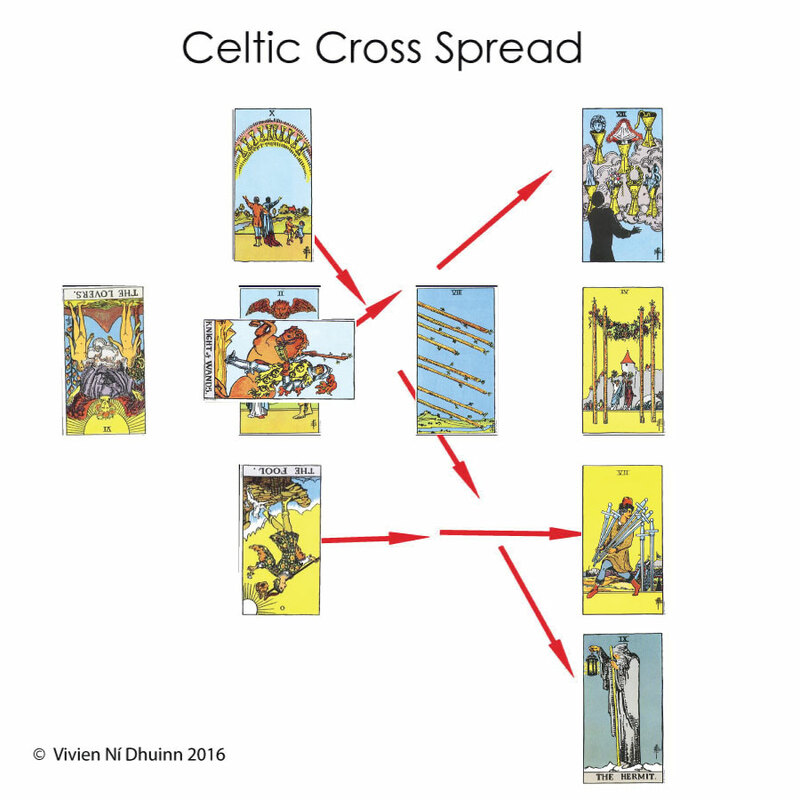 For information on Significators click here Court Cards and The Celtic Cross Spread information page. 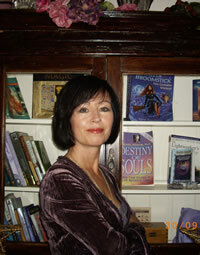 Decide if you wish to include a Base Card in your Reading. The Base Card gives some background information which may prove useful or relevant throughout the Reading. It is an additional Card, and not one of the Ten drawn for the Spread. Ensure your Tarot Deck is Clear of energies from any previous Reading, and that all Cards are Upright before Shuffling. Decide if you you are using Reverse Cards in your Reading. If yes, Reverse some Cards while Shuffling, but not too many. For information on Reverse Cards Click Here. Use whichever Shuffling Method you are comfortable with, but ensure Cards are Shuffled well. If using a Base Card wait until the Shuffling is over and then take the first Card from the bottom of the Deck and place aside where it will be close to the Spread. Once Shuffling is over, draw 10 Cards and place them in the Position which corresponds with the order in which they were drawn. First Card drawn is placed in Position 1 etc. Turn the Cards over so that their pictures can be seen. Does Card 3, The Ideal Outcome, and Card 10, The Outcome line up harmoniously? Are we getting an affirmative or a negative response? Share this potentially good news with the Querant, but remember it is still early days. Which Cards jump out at you? Where is your attention being drawn? Are you comfortable with what you are seeing or concerned? Are There any Major Arcana? Trump Cards carry extra significance in a Reading. There energy is more fixed. Are There Multiple Majors? This could lead to a very Spiritual or Heavy Reading. Are There any Court Cards? Are they People or Energy? Are they Upright or Reversed? Do they look like they are helping or hurting the issue? Astrological Associations – Are there any Card Combinations that might represent a certain Sun Sign? If none then which Elemental Personality is present – Fire, Water, Air, Earth? Are There any Recurring Symbols or Images? Repetition of any of these equal reinforcement of their message. Pay attention. Are there Recurring Numbers? Multiples of the same number will also reinforce the message associated with the Number’s Energy. Know your numbers. Which Suit dominates? What does this tell you? This will give an indication of which Element is driving the Issue or Situation. There may be imbalance if one Suit is overly dominant. Which Suit is Absent? What does this tell you? Note the Absent Suits and the Element they are associated with. An Absent Suit shows a lack of a particular Elemental Energy. Imbalance can be suggested. Are there any Reversed Cards? What does this tell you? Reversed Cards can suggest several things; blocks, extremes, dysfunction, the opposite of the upright and much more. Check out what Reverse Cards Mean in Lesson 3. What Colour Dominates? Is the Spread bright and colourful or dark and dreary? Are the cheerful Cards Upright or Reversed? Are they in the Past, Present, Future or Surrounding Energy? Are the Dark Cards Upright or Reversed? Are they in the Past, Present, Future or Surrounding Energy? What is the Mood of The Reading? Happy, Sad, Lively, Industrious, Carefree, Oppressive, Flat, Positive, Negative? Check out My Reading Analysis Chart for Additional Guides on the information above. Arthur Waite’s Version in The Pictorial Key to The Tarot is laid out below. My descriptions are typed in blue just below so that you can compare the two. They are very similar except that the explanations I have given are generally more expansive. Position 1 – What Covers – ‘This Card gives the influence that is affecting the person or the matter of enquiry generally, the atmosphere of in which other currents work. ‘ (Ref: A .E. Waite, The Pictorial Key to the Tarot, published 1911) – This Card Highlights the issue and the attitude surrounding it. Position 2 – What Crosses – ‘It shows the nature of the obstacles in the matter. If it is a favourable card the opposing forces will not be serious, or it may indicate that something good in itself will not be productive of good in the particular connexion [connection]’. (Ref: A .E. Waite, The Pictorial Key to the Tarot, published 1911) – This Card shows the challenges, obstacles or blocks that need to be resolved in order to move the issue forward. As Waite mentions, a positive card can suggest that the challenge is not that serious and can be easily overcome, or that what is perceived to be a blessing or helpful to the issue, will not turn out to be. It might result in being counter-productive to the aims of the Querant. Give this card some thought as it does present a challenge of some sort. Position 3 – What Crowns – ‘It represents (a) The Querant’s aim or ideal in the matter; (b) The best that can be achieved under the circumstances but that has not yet been made actual’. (Ref: A .E. Waite, The Pictorial Key to the Tarot, published 1911) – This Card shows the goals, dreams, desires and aspirations the Querant has consciously set. It is what is hoped to achieve, the best possible or Ideal Outcome. This also reflects the Higher Self, The Higher Good. Position 4 – What is Beneath – ‘It shows the foundation or basis of the matter, that which has already passed in actuality and which the Significator has made his own’. (Ref :A .E. Waite, The Pictorial Key to the Tarot, published 1911) – This Card reflects the Subconscious/Unconscious urges that have influenced the situation. It delves deep into the underlying forces controlling the feelings, thoughts and actions of The Querant. This card can reveal the shadow self or conditioning from childhood. It is what has formed the energy around the issue or personality. It is normally deep-seated, and if a Reversed Card, will prove tricky to resolve, as it will be directly affecting the situation. If the Card is Reversed, it is unlikely the Querant has been aware of the underlying internal forces driving the situation. If the Card is in opposition or blocking the Desired Outcome in Position 3, The Querant will need to reprogram their mindset through positive affirmations and other methods. Position 5 – What is Behind (This Position to be swapped with position 6 if Significator is looking to the left) – ‘This is behind him. It gives the influence that has just passed, or is now passing away’. ( Ref: A .E. Waite, The Pictorial Key to the Tarot, published 1911) – This Card shows the past, recent past, or an event from the past that has led up to, or brought about the situation. It is likely to highlight how blocks or challenges may have come about. It may also throw some light on the underlying driving forces in Position 4. Position 6 – What is Before – ‘This is before him. It shows the influence that is coming into action and will operate in the near future’, or is now passing away’. ( Ref: A .E. Waite, The Pictorial Key to the Tarot, published 1911) – This Card shows what will come into being in the future, which could be weeks or months. It is how the situation or issue will develop or be influenced in the near future. Position 7 – Himself – ‘Signifies himself – that is, the Significator – whether person or thing – and shows its position or attitude in the circumstances’. ( Ref: A .E. Waite, The Pictorial Key to the Tarot, published 1911) – I read this Card as Advice/Way Forward/Action to Take. It is in Card 7 we begin to move away from the internal aspects and focus on the external. We know the issue, why and how it has come about, where it might be heading and now we are in a position to take decisive action on how to go about achieving the goal or resolving the issue. It is the breakthrough card and shows the Querant a possible way forward. 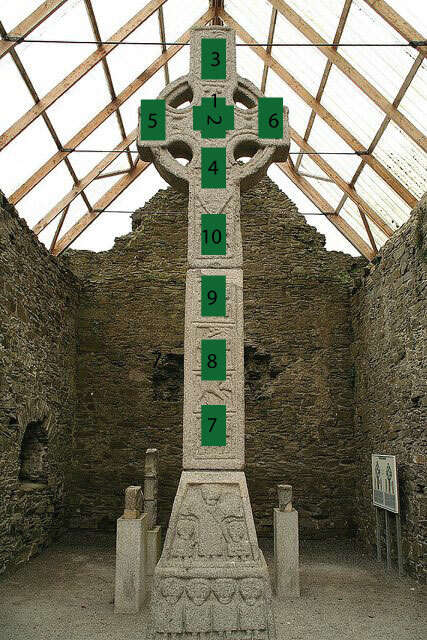 Position 8 – His House – ‘His environment and the tendencies at work therein which have an effect on the matter – for instance, his position in life, the influence of immediate friends, and so forth’. ( Ref: A .E. Waite, The Pictorial Key to the Tarot, published 1911) – I name this Position Surrounding Energies/External Influences. This Card gives an overview of the atmosphere surrounding the issue or situation. It will include other people’s opinions and perceptions, family and friend’s views or attitudes, other’s influences, external trends. This card generally shows things that are largely outside the control of the Querant. Position 9 – Hopes and Fears – ‘Gives hopes and fears in the matter’. ( Ref: A .E. Waite, The Pictorial Key to the Tarot, published 1911) – This Card shows theHopes and Fears of the client surrounding the issue or situation. If this is a positive card, it can suggest that deep down, the Querant is optimistic and has a positive attitude. However, if this card is positive but seems out-of-place with the rest of the cards, it may suggest the Querant is entertaining unrealistic hopes or that they are hoping for something which is not in their best interest. One must be careful of what one wishes or hopes for. It might not appear as attractive or desirable in reality. If the card suggests Fears rather than Hopes, the Querant does not hold out much hope for a positive outcome. Their fears may be un-grounded. They may also be fearful of success. Hopes and Fears can be complex and intertwined. 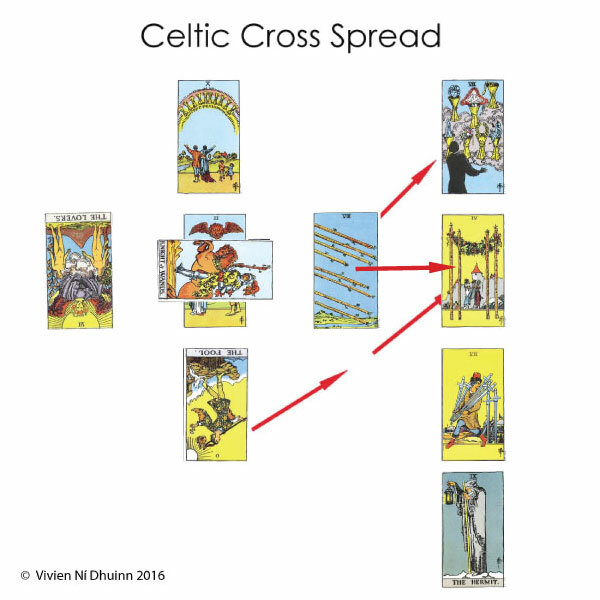 It is best to look to the rest of the Spread for more insight and see if they align with any of the other cards. For example, if the card suggests Fear rather than Hope, and the Card in Position 3, The Subconscious Urges, shows a negative influence, then that is where the underlying fear in probably coming from. If it lines up with the Card in Position 2,The Challenge, or Position 5 The Past and it is a stressful card, there may be a connection. If the Challenge/Cross Card is positive and the Hopes and Fearsappears more like a Hope than a Fear, remember what Waite mentioned about apparent positive Challenge Cards still being a challenge, or that what one thinks is helping, will not. Then it may align well with Hope Card in the same manner. What one is hoping for may not be ideal or productive. Its a tricky one to work with so you will have to tune in as much as possible. This is where a two-way flow of communication with The Querant is necessary. Position 10 – What Will Come – ‘is what will come, the final result, the culmination which is brought about by the influences shewn [shown] by the other cards that have turned up in the divination’. ( Ref: A .E. Waite, The Pictorial Key to the Tarot, published 1911) – This Card shows the Probable Outcome of the situation or issue based on the current actions and mindset of the Querant. It shows the natural outcome of events should the Querant continue on their current path. To forecast a Favourable or Positive Outcome, this Card should ideally align harmoniously with Card 3, The Ideal Outcome to indicate the Querant is on the right path to achieving their Desired Outcome. This means both Card 3, and Card 10 should be Upright (unless the reversed aspect is more positive). Although no guarantee, it indeed looks very promising. Reversed Cards in Position 10 suggests blocks and setbacks to manifestation of Desired Outcome. More effort will need to be applied by the Querant, and in some cases, it is time to let go of what one is questing after (the surrounding cards should provide supporting evidence of this). If the Card that presents in this position is undesirable, the Querant can in some instances take steps to change the Outcome. This could be brought about by paying heed to theAction/Advice Card or making some necessary changes. An unwelcome Outcome Card can suggest the Querant will not act on the Advice/Action Cardgiven in Position 7. A Major Arcana Card in Position 10 carries much weight and suggests strength and fixed energy in the Outcome. Should it beReversed and unwelcome, the Querant will find it very difficult to rectify the situation as its energy will be quite fixed. Remember, there are some Outcomes that will be unwelcome no matter what and there may be very little the Querant can do about it. For example, the relationship he/she desires to succeed may be totally out of his/her control if the other party involved has decided it is finished. Also the Outcome for someone who is terminally ill or very old is also going to be impossible to change no matter how much the Querant wishes and hopes. There is only a certain amount that can be done, except a possible change of attitude to the Outcome; an acceptance for instance that one cannot make things better and must let go. For some issues, there is no going back and no way of changing things around for a better Outcome. This must also be accepted. Before you attempt working with any of the Diagrams below, first see what connections you immediately see yourself. Take a note of them. To conduct this Step-by-Step Guide I have put together a Pretend Reading (see below) so that we can apply the process of interpretation at each stage as we go along. The Reading is fabricated by myself, and therefore, I have taken the liberty of running in a certain direction with my story. I have chosen just one way this Spread can be interpreted using the Cards below. It is based on my fictional Querant and the little bit of background they have given me. These same Cards could Read very differently for anther Querant with their own issue and background etc. While creating the interpretation for the Cards I selected, I found several other story-lines surfacing that I could have gone with instead. It was quite amazing. I wonder if you can create an alternative interpretation yourself? Pick your own Querant and create some background information that relates to the Spread. I have not given a gender to the Querant. I refer to his/her, him/she throughout the Reading etc. The Querant has come about a new relationship he/she has recently entered. The Querant wants to know how successful it will be? That’s all, no other background. However, the Querant is very buoyant, and keeps mentioning their new partner by name every few minutes. They seem very excited. When asked why the need for a Reading so early on in the relationship, he/she is vague in response. The relationship is less than a month old. I sense the Querant is quite eager that the Reading reflects his/her desire. 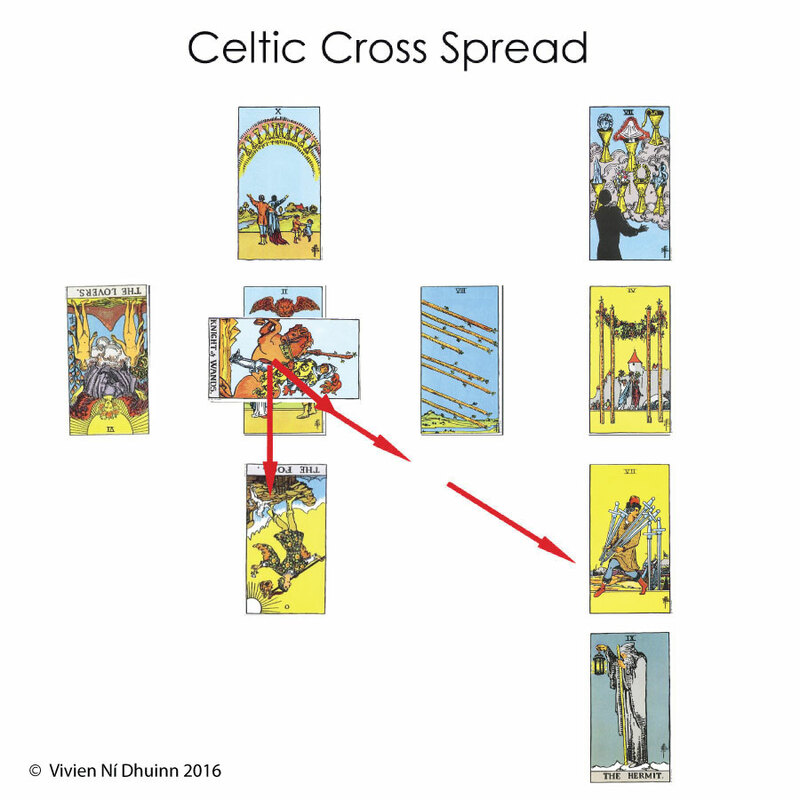 Base Card – I have not used a Base Card for this Reading or a Significator. 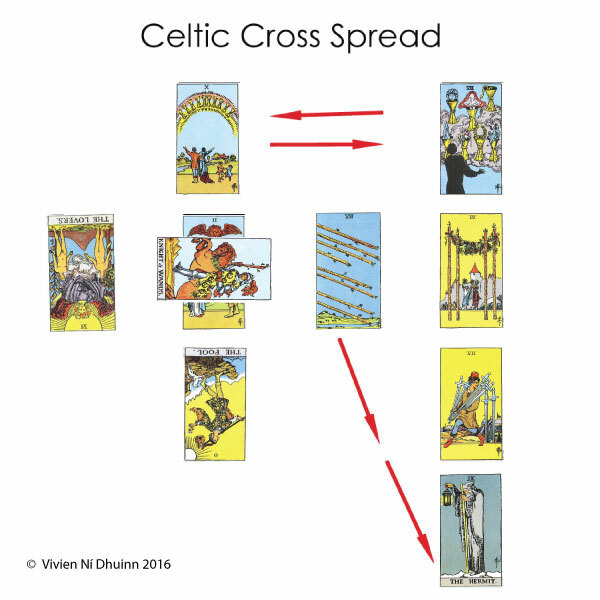 I will demonstrate the use of the Base Card in the next Reading – Cora’s Celtic Cross Career Tarot Spread. Card 3 and Card 10 – Not aligning as one would hope for. Inconclusive. Cards that Jump Out – Reversed Fool, Reversed Lovers and Hermit. Astrological Associations – No Definite sign. Cups and Wands dominant so there may be a Water Sign; Pisces, Cancer or Scorpio or a Fire Sign; Aries, Leo, Sagittarius) Mixture of Fire and Water. Fire can evaporate Water. Water can put out Fire. In Diagram 1 we use Position 1, The Issue, and what Crosses it, Position 2 to launch our interpretation. This is where the crux or focal point of the Reading revolves around. We see the central theme, where the Querant is right now in Card 1, and we also see any obstacles that appear to obstruct or challenge the path that leads to their Ideal Outcome (Card 3). It is a place to start the Reading from. Now, not everyone comes for a Reading when life is sweet in the garden. Yes, many do, just to check up on how well they are progressing, or to prevent issues from occurring that, if warned in advance, could easily be avoided. Generally, people come for Readings when they are anxious about something, need confirmation of their feelings or thoughts, and when they sense something is wrong. So we might wonder what to do with Card 2, What Crosses/Challenges if the Card Drawn appears positive and helpful to the issue? Where is the Challenge to be interpreted? The thing is, there may be no Challenge at all. The road ahead may be smooth and trouble-free. Look to surrounding Cards for signs of red flags elsewhere. The Querant may have been over-reacting to a perceived Challenge or Cross. They might be anxious about nothing, feeling that life is too good to be true. The Challenges in this instance will be minimum and easily overcome. Arthur Waite writes in his book ‘The Pictorial Key to the Tarot’, about Card 2 in the Challenge/Cross Position ‘It shows the nature of the obstacles in the matter. If it is a favourable card the opposing forces will not be serious, or it may indicate that something good in itself will not be productive of good in the particular connexion [connection]’. So he throws some light on the possibility that a favurable, or positive Card 2, could suggest that something perceived to be helpful or productive to the attainment of the Ideal Outcome Card may not turn out to be so. It is worth bearing that in mind when interpreting Card 2. One would have to closely inspect a favourable or positive Card in Position 2 if the Outcome in Card 10 is unwelcome. If there were no apparent challenges or obstacles, then why would the Querant no be successful in their aims? We will begin to put this into practice with our Pretend Reading! In Card 1, The Issue, we find The Two of Cups as the centre of Focus. Here we have the relationship. The Two of Cups suggests the early stage of the romance, and how powerful the force of attraction can be. This suggests the Querant is all loved up and has fallen head over heels for this new person in his/her life. Even though this Card is a baby 2 in its Suit, it can suggest proposals and engagements. This marks a very heady time in a relationship when the need to be with, and see each other is intense. The couple only have eyes for each other and can only see the good in each other. They may not know each other very well at this stage but the strength of their feelings is so great, they will overlook any flaws. This stage in a relationship is when couples are generally on their best behaviour. They can often project a facade that he/she believes will be extra attractive to their partner. They may not be showing their real side. This marks a trouble-free time in relationships when couples feel blessed and chosen. They are the centre of their own universe right now. Nothing on the outside matters as long as they are with each other. What Crosses/Challenges this happy couple scenario is the arrival of The Reversed Knight of Wands. He/she is having a good time and is completely buying into the whole romance bit at present. He/she, has his/her lover, confidante, charming and dynamic facade out at the forefront. He/she is enjoying this part of a relationship and more than likely feels very drawn to the partner. It is a wonderful time to be alive and all is going marvelously well, but The Knight of Wands is Reversed and so we must look at the implications of this. The Reversed Knight of Wands is not known to commit easily, or settle down in one place for any length of time. The grass is always greener on the other side. This Knight likes his/her fun and freedom. He/she bores easily. The Knight doesn’t have a great reputation for faithfulness. He/she is known to be reckless and impulsive at times. The Reversed Knight can head off on a course of action with little thought for the outcome or consequences. Is this the Querant or the Partner who is responsible for the Challenge? If the Querant, then he/she is being very optimistic about the relationship’s chances at this stage, but will they be able to sustain it when the heady days of lust and love begin to settle down, or fizzle out? Regardless of which partner this Knight represents, the fact that he/she is Reversed suggests potential trouble ahead, and not the makings of a strong and stable relationship. We shall see. In Diagram 2 observe and reflect on the energy and associations from Card 4, Subconscious/Unconscious Position,What lies Below as it flows up through Position 1 The Issue, Position 2 The Challenge and on into Card 3, The Conscious/What Crowns Position. Position 4 The Subconscious/Unconscious energy will be influencing what is happening in Card 1 and 2, but what is more important is how well it aligns with Card 3, The Conscious/What Crowns. Remember the Position Card 3 represents the Ideal Outcome, The Aspirations or Goal of the Querant. What we want to see is alignment and harmony between Card 3 and 4, not opposition. Both the Conscious and Unconscious working together to achieve the Desired Outcome. If the Card in Position 4, Subconscious/Unconscious Influences appears to contradict Card 3, or show signs of opposing the conscious desire of The Querant regarding their issue, then achieving their Ideal Outcome, or Goal, is going to be thwarted by the unwanted, and possibly unknown influences coming from deep within Card 4, Position Subconscious/Unconscious/Below. When a Card is Reversed in Position 4, it is quite likely the Querant is unaware of these tendencies. They are not aware of their internal workings in the grand scheme of things. They are not in the driving seat. If the Card in Position 3, Conscious/Ideal Outcome/Aspirations is drawn and appears to contradict what the Querant is aiming towards, then we have to communicate about this. The Querant is saying one thing, yet the Cards point to something quite the opposite. Look to the Card 4, Unconscious/Subconscious Influences, along with Card 8, External Influences for clues as to why this is. Maybe deep down the Querant is seeking something that is being influenced by others expectations, and not truly what they want for them-self. This is a tricky one and it may be worthwhile doing a separate Reading using Card 3 as the Significator, or as Card 1, The Issue. This may yield more information on why the Cards are not expressing the Querant’s Conscious Goal. Also bear in mind that the Querant may have a more pressing issue than the one they seek the Reading for. The Querant may not be at a stage where he/she feels comfortable about sharing it with anyone, yet it is floating to the surface despite their best efforts to contain it. It is okay to ask the Querant if there is anything else on their mind, were they possibly thinking of something else when they shuffled the Cards? Describe what the Card means and ask them if any of it resonates with them in any area of their life. A Querant may be asking about his/her career, yet have a troubled relationship simmering at the back of their mind. Maybe the issue is a secret they don’t want anyone to find out about. There is likely to be something tainting the Reading. Lets us demonstrate this in action. Card 3 appears as The Ten of Cups and The Querant is asking about the potential of a new relationship they have just started. Card 1 is The Two of Cups, Crossed by Card 2, Knight of Wands Reversed. In Position 4, sits The Fool Reversed. Now this would alert me immediately to the possibility the Querant has a tendency to be quite foolish when it comes to his/her choice of partner. I don’t think much thought is put into it. When the Fool Reverses one tends to be heading for a fall, making a bad choice or being terribly innocent or naive. In The Ten of Cups we see what The Querant is searching for, what he/she Desires the Outcome to be. The Ten of Cups is a Stage Card and can be quite over-the-top in expectations of Love, Marriage, Relationships etc. Everything can have a sugar-coated finish, especially when we see The Reversed Fool, another card for fantasy and illusion sitting in the Below Position. For me I would be linking this naive or innocent Desire to the Querant’s quest for a long-lasting relationship. There is nothing wrong with The Ten of Cups in itself, but when I see the energy or subconscious urges that are driving this desire, it knocks it on its head. As we look up through from Card 4 to Card 1 and 2 we see the reality or manifestation of The Reversed Fool’s influence. The Querant has met someone and embarked on a relationship. The Two of Cups shows us how loved up they feel and how drawn they are to this person. However, The Knight of Wands Reversed Crosses the Card and we must immediately remember what this represents for any budding relationship. If we know our Cards and their associations, we will immediately become suspicious of how committed this Knight is to the Querant. It could also be the Querant who is displaying the reversed traits of the Knight of Wands. The Reversed Knight of Wands’ energy does not augur well for relationships. The personality depicted lacks commitment, loyalty and faithfulness. He may be quite a lovely person, but a bit of a rogue, who seduces, has a good time and then moves on to the next. He or she could bore easily. This personality will actively work against getting tied down. He/She may not be aware of the Querant’s secret desire for more. Then again, he may be the bad boy/bad girl type who will hang around, not because of love, but more so to play on the needs of his/her partner by using them as they please. We also have the possibility that this Reversed Knight simply means that he/she is not really interested, or may not be free to commit to another. Now this is just one example. These cards can be read in another manner, but we are running with a story here of my fabrication so let us pretend this to be the case. The question we need to probe now is whether the Querant has a habit of making foolish choices in love? Do they get involved too quickly, fall too fast? Are they blind to what they are walking into? Are they too willing to overlook the warning signs? Do they fail to heed advice from friends and family where love is concerned? There may be immaturity and gullibility. The Fool Reversed does not align nicely with The Ten of Cups. They suggest fantasy, illusion and wishful thinking, but no real substance. So in this case, The Querant is operating on automatic pilot which is manned by the Reversed Fool in the unconscious realm. Because this Card is Reversed, the Querant is unlikely to be aware of this, and probably assumes they are in full control. The Reversed Fool will not lead him/her to the quality of Relationship they so desire. The Reversed Fool is aligning better with the Reversed Knight of Wands, which is the Challenge. Much work will need to be done by The Querant to upright The Fool, or to replace him altogether with something based firmly in reality. There is a lack of grounding in this relationship. In Diagram 3 we focus our attention on reading the flow of energy from Position 5, The Past/What Lies Behind, through the Present Issue, Positions 1 and 2, on into Position 6, The Future/What Will Come. Here we see time moving from the Past, forming the Present, and where it is likely to go next in the Future. We can analyse how past events or experiences have influenced the present issue. If the Card in Position 4 is Reversed, Card 5, The Past, might throw some light on how the Unconscious/Subconscious mind has been affected by past experiences. We could find an explanation here. This can be empowering for the Querant who may not be aware of the connection. The Card in Position 6, The Future, is likely to be formed by all that has preceded it, yet here is where the first potential for change occurs. The Future has not yet come about, and to some extent The Querant can control what happens next. The information gathered in the preceding cards will influence what can be leveraged out of the Future Card in Position 6. Getting back to our example, let’s put this into action. In Position 5, The Past, sits The Lovers Reversed. We immediately begin to link this Card to the Fool in Position 3. The Lovers Reversed suggests incompatibility in relationships, failed relationships, lack of true intimacy, lack of communication, and not being open and honest about needs. The Lovers Reversed also highlights the possibility of making very poor decisions about relationships in the past. Because this is a Major Card I will go with the theory that The Querant sees a Soul Mate in all previous relationships. He/She is too eager to find links and connections in their partner that may not exist. Here we have the Reversed Fool jumping in before giving any real thought to suitability. There may be some confusion between love and lust. Also there is a hint of an inappropriate relationship, lack of fidelity and affairs. The Querent’s past experience with relationships does not create a healthy environment for a current one, especially when we see the Reversed Fool has been influencing it. Values and morals need to be questioned. In Position 6, The Future sits, The Eight of Wands. Here we see how the relationship is set to develop. Certainly it will take off and life will be very exciting and dynamic. This Card ties in nicely with the Reversed Knight of Wands who is responsible for all this fire and activity and The Fool will joyfully follow him wherever he goes. This relationship is still in its early stages as seen in the Two of Cups. It looks like it is being carried by an energy and builds momentum as it moves into the near future. Nothing will stop the force of The Eight of Wands. It is a very promising card in relationships and speaks of those heady days of love, being swept off one’s feet and not having the time to eat or sleep. Those Wands, just like the Querant, will have to come down to earth as some stage. Then the relationship can be properly evaluated. Until then, much fun and happiness is forecast. However, the Reversed Knight of Wands is bound to have shown some hints of his/her personality, which will obviously be disregarded at this intense stage. With a Reversed Knight of Wands, Reversed Fool, and now The Eight of Wands, we might have travel suggested with this relationship, or someone met while travelling. I don’t think the Querant knows a lot about their partner yet. In Diagram 3 we are looking at the connections between Position 3, Conscious Aspirations/What Crowns it and Position 10, The Outcome. What we ideally want to see here are Two Cards that complement each other. We want suggested alignment of the Ideal Outcome and The Potential Outcome, which we know are two different things. What we ideally want to happen, doesn’t always, or we do not take the necessary action to ensure it does. Others can also interfere and influence the Outcome for us. If there is conflict between these two Cards, or they appear at odds with each other, then the Querant will have a difficult time achieving their Desired Outcome, or that it is not meant to be. Arthur Waite suggests that should a Court Card appear as Position 10, then The Outcome will be determined by the person represented by The Court Card. If the Querant is not identified by this Court Card then it is another who will be the final decider on the issue. The Outcome falls into the hands of someone other than the Querant. Should you decide to go with this method, Waite suggests using the Court Card from Position 10, The Outcome as the Significator for the next Reading. In Diagram 4 we also look at the connection or link between Position 6, The Future and Position 7, Advice/Action/Way Forward. What we want to see again is alignment between the The Two Cards in their Positions if they are both positive. If they form a natural progression, then the Querant is on the right path to achieving their goal. If the Advice Card opposes the Future Card then there may be a problem with what the Querant wants or think he/she wants, and what his/her inner guide advises. Remember, when we move into The Staff part of the Reading, we move outside the realm of the Querant and the core of their issue to see how it is perceived and operates in the outside world. Putting this practice into action in our Pretend Reading we have The Seven of Cups in The Outcome Position, Card 10 and in the Advice/Way Forward, Card 7, we find The Hermit. Now this has certainly taken a grand swing away from all the heady and intense romance. In Position 7, Advice/Way Forward, The Hermit appears to slap on the breaks of the fun-loving pursuits and attempts to bring a form of calm and moderating influence to the issue. The Hermit seeks to advise and counsel on this matter, and I think his message to the Querant is to ‘Know thyself, before you attempt to know another’. This suggests to me that The Hermit is having none of the the carry on, and wants the Querant to step back and contemplate on what they are doing and why. From my other theories I believe he is trying to apply the voice of common reason to the situation. He carries an air of prudence about him. It is as if he looks up at The Reversed Fool, The Reversed Knight of Wands, The Two of Cups, Ten of Cups and Eight of Wands and warns that it will all end in tears. He has seen it all before and wonders why The Querant does not learn from his/her former mistakes? It’s because the Querant never takes the time out to ponder this. Instead he/she runs from one relationship to another, chasing a dream that is probably just a fantasy. If they stopped to reflect on their actions, then the right partner might be found, and for all the right reasons too. The Hermit suggests the Querant still has a lot to learn about real love, and about him/her self. We also look to Position 3, Desired Outcome, The Ten of Cups, and Position 10 The Outcome Card, The Seven of Cups to compare them. Do we see alignment and harmony? Does the Outcome complement the Desired Outcome. In this instance it doesn’t, and where we have the full manifestation and expression of love, commitment and values in The Ideal Outcome, Position 10, The Ten of Cups, we see a figure who still doesn’t know what they are looking for in The Seven of Cups. In the Seven of Cups we find the Querant still on their quest in search of love. He/she still hasn’t figured out exactly what he/she wants, or their definition of happiness. There is a lot of confusion. There is definitely a link with the Rainbow aspect of the Ten of Cups and the cups sitting on clouds in the Seven of Cups, but I feel that it is of the illusory type. There seems to be unformed ideas and also a feeling of not being sure about this relationship being the real deal. The covered figure on the Seven of Cups alerts me to the possibility that the Querant doesn’t feel the partner at present is who he/she is looking for. That ideal candidate is concealed, hasn’t appeared on the scene yet. However, I see temptation and getting carried away by all the bling and superficiality that surrounds this relationship. There may be some hope for the Hermit here. Will the Hermit begin to exert some influence on the Querant? After all The Seven of Cups is a Soul Searching Card, and not really one of action. We see the Card encouraging the Querant to make a selection, to pick and decide, but he/she is unsure which cup is best. Maybe the Hermit can find a way in here and suggest reflection rather than selection at this stage. Remember The Reversed Fool, Reversed Lovers and Reversed Knight of Wands? How reliable has the Querant’s judgement been in the past? Because the Outcome Card is not exactly what The Querant had hoped for, which was validation of the Relationship and its future, it would be useful to use this Card, The Seven of Cups as the basis for a new Reading. 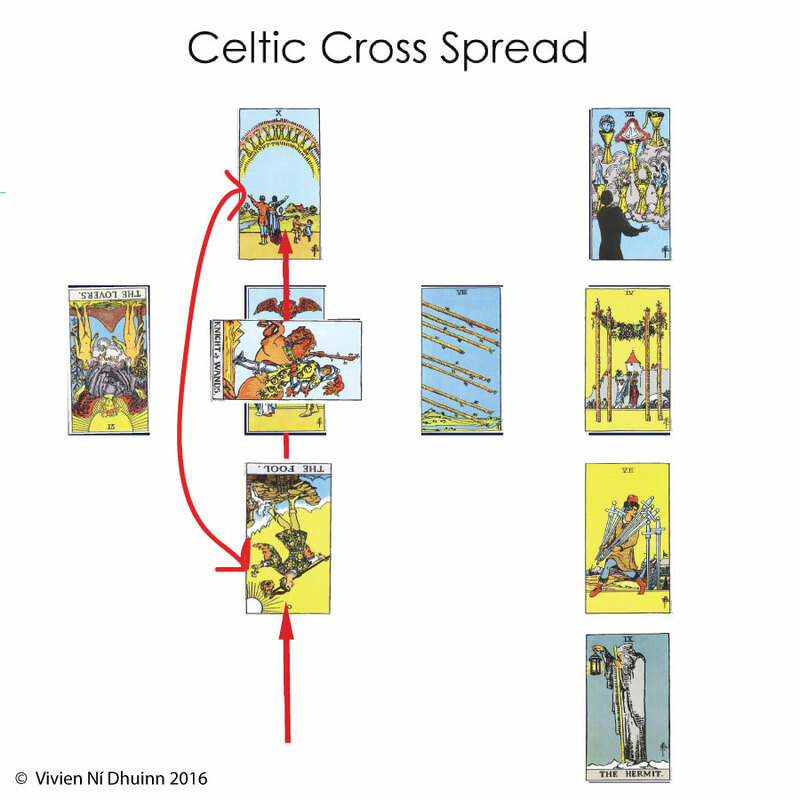 In Diagram 5, we focus on any possible connections or leads between the Challenge/What Crosses, Position, Card 2 and The Subconscious/Unconscious, Position, Card 4. If we find a healthy influence coming from The Card in Position 4, the challenge in Card 2 may not be too difficult to surmount. Also it may be coming from external influences which we need to look to Card 8 for, External Influences/Surrounding Atmosphere. It is in Card 8 we might find a reference to what or who might be creating the difficulties surrounding the issue. However, if the Card in Position 4, Subconscious/Unconscious Influence, appears problematic or unhealthy in its influence, then it is more than likely feeding The Challenge of Card 2. However, Card 8, External Influences must also be taken into consideration. What if any connection is there between Card 2, The Challenge/Cross, and Card 8, the Surrounding Energies. Is this challenge coming from the outside? Is someone, or something, making it more difficult for the Querant to achieve their Ideal Outcome? What is the general atmosphere between these two Cards? When it comes to applying this to our Reading, we have already done considerable work on determining how The Reversed Fool in Position 4, Unconscious/Subconscious Influences is likely to be influencing or guiding the Querant when it comes to the selection of partners. The Two of Cups is a lovely Card on its own but we cannot run with that simply on the basis that it’s romantic and blissful. We must consider what is happening around this relationship. The Reversed Fool, has a tendency to make unwise decisions when choosing a partner. The Reversed Fool has a tendency to jump into relationships without giving much thought. The Reversed Fool has a tendency to make mistakes but rarely learns from them. This is what guides the Querant in their search for love. If the Reversed Fool is working as I suspect he might be, the result will be the makings of the Reversed Knight. Now we inspect the relationship between Card 2, The Challenge, Reversed Knight of Wands and Card 8, External Influences/Surrounding Atmosphere, The Seven of Swords. These two Cards are not a good sign, as the Reversed Knight of Wands is dubious enough on his own when considering a loyal, committed and faithful partner. When we view him with The Seven of Swords confirmation is almost overwhelming. The Seven of Swords brings a break of trust, lies, deceit and underhand behaviour. There is something that does not add up about this relationship. Is the Querant aware of this possibility? With the Ten of Cups riding high on the agenda, I doubt it. The Reading is about the potential success for this relationship. Would the Querant volunteer for a long-term relationship under such circumstances? If he/she has made foolish mistakes in the past where love was concerned, then it is not beyond belief that he/she would sign up again for another one. What is strongly coming through though, is the energy of an affair. Now here is the dilemma. Is it the Querant who has found someone lovely but will mess it up because of their own tendencies to wander or stray, or is it the partner they are involved with who is the guilty one? The Cards could be implying either or both. We need to become sleuths as it often happens that a Querant will seek a reading about a relationship they are in, but will fail to tell you that their partner is married, that they are married, that they already have a partner. The Reader is not made privy to such information. Oh believe me, it happens all the time, but the Cards will usually reveal such secrets and the Reader may have to ask some embarrassing questions. However, it doesn’t mean they will be told the truth, as often the Querant will deny the implications of the Cards, but you will know! In Diagram 6 we look for leads and connections between Position 3, What The Conscious/What Crowns it, and Position 7, Advice/Way Forward/Action. Do these cards align? How do they compare? Is the Advice or Action in keeping with the Goals of the Querant, or does it appear to point in another direction? If they look complementary, then the Goal is within sight and the Querant is on the right path to achieving it. The Cross or Challenge is not too great. If there is a lack of synergy between these two Cards, The Querant may be looking for something that is not in their best interests or are disconnected from their own power in the situation. We also look at Position 2, What Crosses/The Challenge Card and compare it to The Outcome Card in Position 10. Does the Outcome Card give evidence of overcoming the Challenge or does it suggest the Reverse, as in the Challenge being too much to overcome. Which wins out in the end, Card 2, The Challenge/Cross, or Card 3, The Ideal Outcome/Conscious/Aspirations? Card 10 will certainly point to which one is victorious in this regard. However, nothing is ever black and white in these situations. There may be no outright winner. It may very well suggest that another approach is necessary, or that Advice has not been heeded. Another Reading with The Outcome Card as the Significator would probably yield more insight into the unsatisfactory or vague Outcome. Now we look from Position 4, Conscious/Subconscious Influences to Position 8, External Energies/Surrounding Atmosphere, and see how well they compare. Do they align with the Querant and their issue, or do they seem in opposition? What do they say about each other? Do they complement each other in a healthy manner? If Card 4 is Reversed, has the Energy of Card 8, External Influences anything to do with it? Is it causing it or trying to help it? Does Card 8 appear judgmental or sympathetic towards the Reversed Card 4? Do they belong together? We need to find out the how this issue is viewed through the eyes, minds and feelings of others, and also the general trend of the environment the issue is operating in. Is the Querant’s house in order, is their environment a healthy place to be? Is it helping or hindering the Querant in their quest? Getting back to our Pretend Reading, We will compare Position 3, What Crowns/Conscious Desire/Goal, Ten of Cups with Position 7, Advice/Way Forward/Action, The Hermit. The Desire is full steam ahead for a long-term relationship and all that comes with it. The Hermit thinks that it is indeed a noble and admirable Goal, but in this instance I believe he acts as the voice of prudence. The Hermit is quite reflective about this relationship and seems to ask the Querant to be so too. This might entail, the Querant having to step back from the relationship so that it can be viewed from a distance, and not at the intense level it operates at present. Serious consideration has to be made, and The Hermit would not advise rushing into any long-term commitments right now. When I look at the connection between these Two Cards I am beginning to feel The Hermit is suggesting taking a break from this relationship, or indeed all relationships until the Querant is in a better state of mind, and can be sure they are doing the right thing. With the Reversed Lovers in the Past, The Two of Cups in the Present, The Ten of Cups being chased after, and the current involvement with the Reversed Knight of Wands, we could easily be looking at a personality that doesn’t like being single for any length of time. Hence the trap of The Seven of Swords. There is a lack of discernment and integrity. This might be what drives him/her into forming any relationship rather than being left on their own. I think we all know someone who doesn’t feel happy unless they are part of a couple. Could this be an issue the Hermit is drawing our attention to? Any partner, rather than none? Now we will look across from Position 4, Unconscious/Subconscious Influences, The Revered Fool to Position 8, External Influences/Surrounding Energies to see what the rest of the world, family and friends think of the Querant and their Goal. How is it being perceived on a broader scale? Here we find The Seven of Swords and we smell trouble. Most Readers will agree that The Seven of Swords is not a good sign in a Relationship Reading. It suggests, deceit, underhand behaviour, and unfaithfulness. It also strongly hints at someone not looking where they are going, heading in the wrong direction. This immediately inclines us to look back up at The Reversed Fool. We see a strong link between these two Cards. The Fool is not looking where he is going. Neither is the figure in the Seven of Swords. They both look to be heading for trouble. So this in the environment the Querant and their Issue is operating in. It doesn’t look exactly healthy does it? We wonder what friends and family have to say about it all, what outsiders looking in would think if they knew the full story? We look back to The Fool, and this time to the little dog who barks insistently in an attempt to warn of the cliff he is about to step off. The Reversed Fool does not heed the warning or advice of others. He will do what he wants to do, what he feels on impulse, not on reflection. In the Upright Fool, the dog may still try to warn him and he may still ignore, but he has a much better chance of survival when Upright. In fact, the warnings and advice from the dog in the Upright Fool, can often suggest the limiting mind-set of others as they attempt to project their fears onto him. They see disaster and doom, instead of chance and opportunity. We are dealing with The Reversed Fool, and I feel this relationship is not well received by those around him. Then again, if this is an inappropriate relationship, it may be secret. Friends and family may be unaware of what is going on. The energy this relationship is operating in is not healthy. Something is out-of-order. Someone is not being exactly truthful. The Hermit will have to shout quite loud to be heard. Let us now compare Position 2, The Challenge/What Crosses, The Reversed Knight of Wands with Position 10, The Outcome, The Seven of Cups. Is the challenge or block overcome in The Outcome? It really depends on which point of view we approach it. If the Challenge is The Reversed Knight of Wands and the Desired Outcome is The Ten of Cups, it doesn’t look very successful for the Querant’s Goal or Aim, but it might be the best Outcome all round. Does the Querant really want the Desired Outcome if time is spent working with The Hermit? Probably not, and there will be relief at not succeeding. What Crosses it stays what Crosses it and is not resolved. The Reversed Knight of Wands continues the way he/she is, but something has changed in the Outcome Card. The Reversed Knight of Wands has lost his/her strength and influence. The Seven of Cups brings a bit of sobering up and a confused period of having to make sense of all that has happened. It is not totally clear which way it will blow in the long-term as the Seven of Cups really does not tell us one way or anther. It possibly suggests an interruption, some confusion, and a struggle to understand who and what The Reversed Knight of Wands is and really means in the grand scheme of things. I see a certain disillusionment in The Seven of Cups, and an attempt to grasp in The Future what brought about The Reversed Knight of Wands and why. We certainly need more clarification. In Diagram 7 we compare Position 6, The Future, The Eight of Wands with Position 10, The Outcome. Is the Querant’s next step or action going to take them closer to achieving their Ideal Outcome or Desire? Do these Cards line up harmoniously? What we want to see is a natural progression towards a successful Outcome? If not, then the Querant may not be on the right path, or taking the action that is necessary. Look to the Advice Card, Position 7, to determine if the Querant needs to adjust their strategy or method of approach. Remember, the Querant’s Desired Outcome may not serve their best interests, so where they think they are heading in the near Future may not bear any resemblance to their eventual Outcome if it is all not meant to be. Card 7, Advice, Card 8, External Energy, and Card 9, Hopes and Fears should give some clear evidence of why this might be so. In this Diagram we will also look at how Card 4, Subconscious/Unconscious Influences to see how it relates to Position 9, Hopes and Fears. If Card 4 appears positive it should have a strong influence on building optimism surrounding the issue. This is a good sign. We would expect the Querant to feel hopeful rather than fearful. Card 9, Hopes and Fears, will tell a lot, and if it veers more to the fearful side, look to Card 4 to see if this is where the problem lies. Check out Card 8, Surrounding Energies too. If Card 4 is Reversed and apparently negative, it will be impacting the mindset and outlook of the Querant. This can cause self-sabotage. It can also lead to delusional thinking and false hope. We really want to see Hopeful Cards in Position 9, a healthy Subconscious/Unconscious Influence Card 4, and a supporting affirmative Card 8, Surrounding Energy. Even if the Desired Outcome does not appear to manifest in Card 10, Final Outcome, the Querant will not be adversely affected by it if supported by the influence of Card 4. If Card 9 appears Fearful, it may also point to Fear of achieving a Successful Outcome and all that it entails. What do they really fear and can they define what fearful actually means to them? The rest of the Spread and demeanor of Querant will be telling. We also compare Card 6, The Future, with Card 9, The Hopes and Fears. Is the Near Future Compatible with The Hopes and Fears? Is there anything coming in Card 6 that will influence or create the energy in Card 9. Will what is found in Card 6, The Future, encourage Hope around the issue or will it instill Fear? Now we apply this to our Pretend Reading. Comparing Card 6, Future Position with Card 10, The Outcome, The Ten of Cups. They appear to have little in common. The Eight of Wands offers us strength and free-flowing energy. It suggests the Relationship taking off and a sense of common goals and aims of both partners involved. In the early stages it all looks so viable, so achievable. It seems like the only way to go, and there is high energy and intense feelings propelling all those Wands forward. I mentioned earlier, that what goes up must come down, and in Card 6, we see how high the Relationship is flying. It appears the Wands eventually come down to land by the time we reach The Outcome, The Seven of Cups. The Wands that started out on such a high note, may have lost their lustre after landing. Their momentum has ceased. They have arrived at their destination, but are the Wands happy with where they have found themselves? We see confusion in The Seven of Cups. Something is wrong, but will the Querant be tempted to stay with the illusion built around their relationship, or will he/she begin to face reality. After time spent in this Relationship, The Querant may be noticing things about it, or their partner. As they stare into the Seven Cups, they may see things that attract them, but also things that repel them. Not every Cup holds joy and magic. Some are unsettling, but the truth is there if the figure wants to look further than the fantasy. Magic bubbles have a tendency to burst which can be very disappointing all round. The Ten of Cups is such a lovely Card, but teamed with The Seven of Cups, fantasy, daydreaming , and wishful thinking may be hard to break away from. It is doubtful The Reversed Aspect of The Knight of Wands is even noticed when there is an overactive imagination to wave a magic wand over any dubious areas. The Eight of Wands is a fantastic Card in a Reading but it must be supported by other Cards that confirm its wonderful contribution. Otherwise, it can be a ‘getting carried away’ Card, or simply a hectic, crazy busy time, especially in the early stages of a Relationship. In this Reading we can see a story emerging and The Eight of Wands suggests the best part of the romance has still to come. It will reach a peak in Card 8, but from there on its energy seems to dissipate. That is unless we take in the Four of Wands in the Hopes and Fears Section. Looking across from Card 5, The Future, Eight of Wands, to Card 9, Hopes and Fears, The Four of Wands, we can see why The Querant at this stage holds out hope of this Relationship really going somewhere. With supporting Cards such as The Two of Cups and Ten of Cups we are getting a theme of marriage or celebration surrounding this union. The Four of Wands is a Card for domestic bliss, celebrations, engagements, weddings and gatherings. The Four of Wands supports The Ten of Cups in the Desire and Hope for this Relationship to be the one that works and lasts. I believe the Querant really feels this relationship to be special, and that it has the potential to go all the way. With all those Wands in the air in The Eight, this is understandable to assume they are going in the right direction. With life looking so wonderful in the Near Future, why would the Wands decide to veer off course or come down to land before they have reached their intended destination? The Eight of Wands, Two of Cups and Reversed Fool are feeding the Hope of The Querant in this instance. If the Reversed Knight of Wands could only Upright himself, The Seven of Swords be replaced by something quite different, and a symbolic ‘Thumbs Up’ Card taking the place of the Sobering Hermit, we might allow ourselves to get carried away. If the Outcome Card was more in theme, we might also feel like congratulating the Querant and wishing him/her the best of luck. However, it is not the case, and with the Reversed Fool, driving the whole situation, I believe The Four of Wands is suggesting False Hope. The Ideal Outcome in the Ten of Cups is leading to high hopes, great expectations and felicitations. In this last Diagram, we take a look at Card Position 2, The Challenge/ What Crosses, to see how it is affecting the Card in Position 9, Hopes and Fears. Card 9 should yield information on how strongly the Challenge is being experienced by the Querant. If the Card looks Hopeful in Position 9, then the Challenge or Cross of Card 2, will not seem so great. The Querant is hopeful about overcoming the situation. On the other hand, they may not be fully aware of what is going on in Card 2 and be oblivious to feeling anything but Hope in the situation. In reality, they may have more to Fear than they realise. If there is a Reversed Card in Position 4, The Unconscious/Subconscious Influence, they may be Hopeful about a situation that is not in their best interest. Hopes and Fears is a tricky area. When we get what we hoped or wished for, it does not always turn out as we expected. Also what we Fear in an Outcome may turn out to be a blessing in disguise. You really need to work all this around in your head and consult surrounding Cards to find out what exactly is going on. The Block or Challenge in Card 2 may be stopping us from making a mistake, even if we are wishing or hoping for it to go away. Of course hindsight is a wonderful thing. We don’t get to feel grateful until after the event, when we have exhausted ourselves chasing the wrong Goal, Vision or Dream. We also will look at the relationship between Card 7, Advice/Action/Way Forward and Card 10, The Outcome. How well does the Advice or Action match the Outcome. How well do they align? Does it appear the Querant has taken the Advice on board, or proceeded on the course of Action suggested by Card 7? If the Outcome is unwelcome then return to the Advice offered in Card 7 so that the Querant can see what they need to change, and any matters that need to be addressed. An Unwelcome Outcome Card will actually entail the whole Reading to be re-visited to summarise on the overall issue. Finally, let us compare The Past, Card 5, with The Outcome, Card 10. How will the Past influence the Outcome? Has there been progress made from Card 1 to 10? If there was a problem in the Past, has it been overcome in Card 10, or is the Past still influencing actions, attitudes and behaviour moving forward into the Future? The distance traveled between these two Cards is very important. Now we apply this to our Reading. Compare Card 2, Position Challenge/What Crosses, The Reversed Knight of Wands with Card 9, Position Hopes and Fears, The Four of Wands, we can see that The Querant is more than hopeful about achieving the Desired Outcome. The Reversed Knight of Wands as being The Cross, does not seem to have any bearing on the positive outlook of the Querant. He/she does not see the Reversed Knight of Wands as anything to get too concerned about. This is wonderful to see but based on the rest of the Cards in the Reading, especially the Reversed Fool driving the situation, and the associated traits of the Reversed Knight of Wands, the Seven of Swords, the Reversed Lovers in the Past and the Ideal Outcome being the Ten of Cups, we worry about what the Querant is hoping and wishing for. Are they not concerned at all about the implications of The Reversed Knight of Wands? Comparing Card 7, The Advice Card, The Hermit, with that of Card 10, the Outcome, The Ten of Cups, we are in two minds as to how well these Cards align. The Hermit is the voice of prudence, reflection and retreat in order to understand that what drives and influences. The Hermit instigates self-analysis, self-questioning. The Hermit sobers us up and draws us away from all the bling and fairy glamour. In the Seven of Cups the Querant may indeed stop, pause, and begin addressing troubling feelings that have surfaced. He/she may start to do some long overdue soul-searching, especially if something has happened, or they sense a drop in the energy of the relationship when all those Wands eventually land. The Hermit will then have exerted his influence. However, The Seven of Cups is a multiple choice Card. Fantasy, Illusion, and building Castles in the Sky may be the pick of the day. This Card in the Outcome Position could suggest the Querant continues on their path of make-believe, refusing to entertain the reality of their situation. This path often leads to disappointment when reality is eventually forced upon one. With this Card being a Wish Card it ties in nicely with The Ten of Cups and The Four of Wands. There is a good chance the Querant will run with this for some time to come unless The Hermit is strong enough to intervene and possibly bring to bear the implications of the Reversed Knight of Wands and The Seven of Swords. As a Reader, you could draw two additional Cards to flank The Seven of Cups in an attempt to gain further insight, or a separate Reading could follow using The Seven of Cups as Position 1 or as the Significator. Looking now at Card 5, Past Position, Reversed Lovers to see how much progress has been made by Card 10, The Outcome, we can see that the Querant appears to be confused about relationships in general and is avoiding taking responsibility for where they are. The Seven of Cups shows the Querant quite lost and struggling to establish emotional understanding. He/she is not sure of what love really is and I believe it goes back to not having a proper personal relationship with the self. There is a lack of integration and balance. This might go back to not being exposed to the nature of a proper relationship when younger. There may not have been a parental role model or possibly a dysfunctional childhood? I get the sense of looking for love in all the wrong places and not being able to discern what is good and what is bad. Morals and values seem to be all over the place, and with The Seven of Cups I sense excess. There may be too much partying associated with relationships and no real quality time. I can see exhaustion and burnout setting in, in the Seven of Cups. The Querant may lose sight of their moral compass. I believe there is a repetitive pattern here where relationships are concerned. The Hermit could be suggesting that counselling may be of benefit.